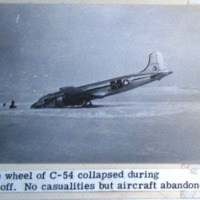 A C-54 aircraft sits nose-down in an icefield with its tail up at an odd angle. 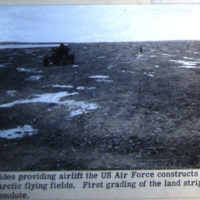 Pictured is a large aircraft labelled ARCTIC QUEEN with three men standing in front of it and several packs of equipment in the background. 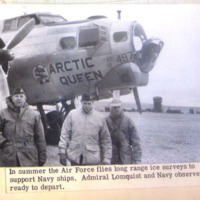 The three men are indicated to be Admiral Lomquist and two Navy observers in the caption. 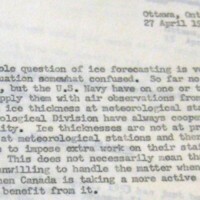 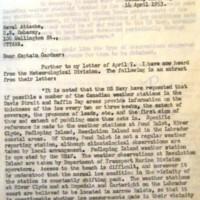 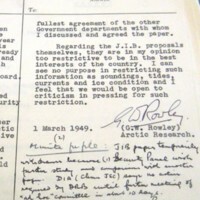 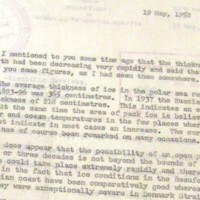 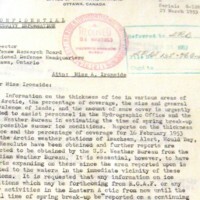 Three paragraphs from a larger document discussing specific data points and figures on the thickness of ice in Canada, requested because the requester had heard that the ice "had been decreasing very rapidly"
An excerpt from a document that discusses ice forecasting in Canada and how it has been conducted in the past and the challenges that consistently conducting ice forecasts poses in the future since it was not common practice previously. 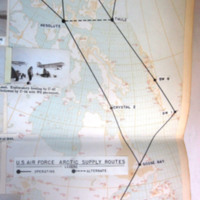 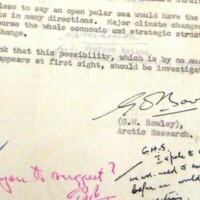 A letter from the US Navy to the Defence Research Board requesting certain scientific information such as prevalence of lead and amount of snow cover in the Arctic for the US Government.